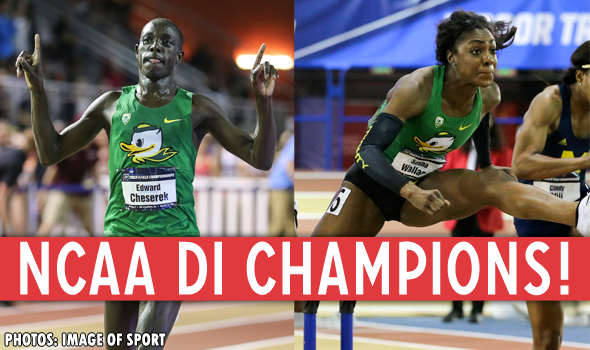 BIRMINGHAM, Alabama – For the second time in the past three years, it was a clean sweep of the NCAA Division I Indoor Track & Field team titles for the men and women of Oregon. The Ducks men won their third consecutive title with 62 points for a comfortable 23-point win over Arkansas, while the women from Eugene, with 53 points, claimed their sixth title in the past six seasons – clinching a much-tighter three-point win in the final event over last year’s national champion Arkansas women. Rounding out the podium for the men were Arkansas with 39 points, Tennessee with 34 and LSU with 28. This is the second year in a row the Ducks have won by 20 or more points; a year ago they topped Florida by 24 points. The race was much closer for the women as Arkansas was runner-up with 50 points, followed by Georgia at 45 and Texas at 44. Oregon becomes the fourth men’s program in meet history to win three-or-more titles in a row – joining Arkansas, Florida and UTEP – largely on the back of the Herculean effort from Edward Cheserek. The junior followed up a 5000-meter and distance medley relay double for 12½ points on Friday with a national title at 3000 meters on Saturday. He joins former Duck Galen Rupp from 2009 as the only men to accomplish that feat. Rupp won the inaugural Bowerman Award that year, an accomplishment that has thus far eluded the two-time Finalist Cheserek. But there were 39½ points that didn’t come from the King. Devon Allen made a triumphant return to the NCAA Championships – he won the NCAA and USATF outdoor 110-meter hurdles titles in 2014 before suffering a football injury – with a national title in the 60-meter hurdles. Blake Haney and Sam Prakel combined for 13 points in the mile with runner-up and fourth-place efforts, respectively; Greg Skipper got fourth in the weight throw; and Nate Moore earned an unexpected four points in the triple jump. Oregon’s women matched the 1991-1997 LSU women for the most titles in a seven year span with six. The Ducks tie Texas for the second-most titles in Championships history with six, and both trail LSU’s 11. The Oregon women got an individual title from outdoor national champion Raevyn Rogers at 800 meters, and huge points from a deep group of sprinters and hurdles in the 60, 200 and 60-meter hurdles. Hannah Cunliffe was runner-up at 60 meters and third at 200 meters, while Sasha Wallace finished second in the 60-meter hurdles. Jasmine Todd was fourth at 60 meters, Deajah Stevens was fourth at 200 meters, and Alaysha Johnson was eighth in the 60-hurdles final. It came down to the meet finale 4×400 relay for the Ducks to clinch over Arkansas. Though the Razorbacks edged out Oregon in the second of three sections, the Ducks’ third-place overall effort after the results of the third section came through was more than enough to hold of Arkansas. Arkansas made a valiant effort to defend its national title, getting a win and meet record in the pole vault from Lexi Weeks and a historic three-woman scoring effort in the pentathlon on Friday. No other team in meet history had ever finished with three top-eight pentathletes in the same Championships. Georgia scored 45 points to finish third without any entries in the track events. The Bulldogs got national titles from Kendell Williams (and a collegiate-record) in the pentathlon and Keturah Orji in the triple jump. The two were part of the highest-scoring long jump trio in meet history as the Bulldogs went 3-4-5 in the event on Friday. Rounding out the podium was Texas, which got national titles from Teahna Daniels at 60 meters, Courtney Okolo at 400 meters, and in the 4×400 relay.